Yannig Le Treut, Saccharomyces cerevisiae boulardii CNCM I-1079 improving sows digestibility… new results, but old idea isn’t it? “First signs came in 2005 when we started the application of S. cerevisiae boulardii CNCM I-1079 in sows in Britany. At the time, certain farmers, called us after 5-6 months asking why we did not warn them about the effect on sow body condition! We were surprised at first as they told us they had to reduce the feed level to prevent the sows from getting too fat. This is what motivated us to look into this effect more carefully. So you didn’t perform any specific trial to highlight this effect? And what was the idea of this study? This is how we ended up with the study performed by Etienne Labussière at INRA Pegase? 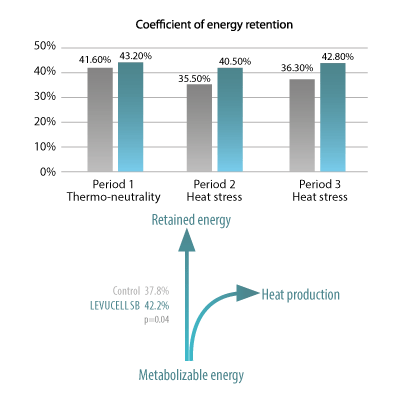 Figure: effect of live yeast Saccharomyces cerevisiae boulardii CNCM I-1079 on the ratio between metabolizable energy and retained energy during heat stress and thermos neutral periods (INRA Pegase, 2015). 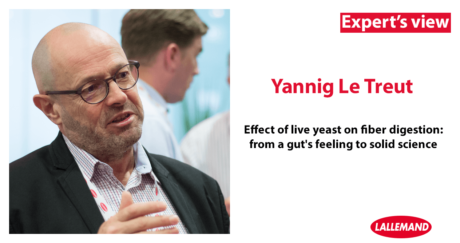 What would be the mode of action that explains the interaction between live yeast and energy saving in pigs? “On one side, the better valorization of the fiber through improved hindgut environment (redox potential through oxygen scavenging). How do you apply it in gestating and lactating sows? “For lactating sows, with feed intake the major issue, especially in heat stress period, I would just add S. c. boulardii on top to bring the sow extra energy. It does prevent the sow from utilizing energy from fat and muscle which has a negative impact on future cycles. In conclusion, what would you consider as the primary benefit of S. c. boulardii? “The cornerstone of pig production is the farrowing: if it is successful, the cycle is successful and the following cycle is well prepared. S. c. boulardii has proven effects on sow transit and gut microflora around farrowing with positive impact on the farrowing process, sow health and piglet growth. We have also seen effects on sow immunity and colostrum quality, which in turns offer better protection to the piglet through colostrum.